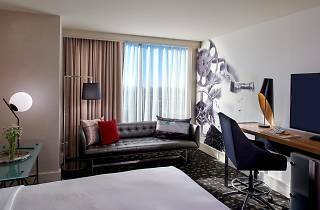 With Angelino-approved accoutrements like complimentary yoga mats and a backlot-inspired restaurant, the Kimpton Hotel Palomar Beverly Hills offers a decidedly L.A. take on the boutique chain’s playful upscale aesthetic. 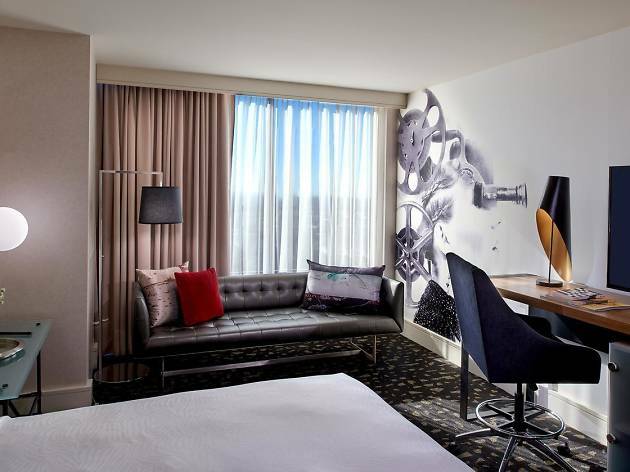 The Kimpton Hotel Palomar Los Angeles Beverly Hills straddles the neighborhoods of Beverly Hills and student-friendly Westwood; much like its location, the hotel is a vivacious balance of posh and playful. The decor is a modern mix of steel, leather and wood, elevated with a few locals-only accoutrements: in addition to the boutique chain’s signature animal print robes, complimentary yoga mats come standard in every guestroom, and subtle nods to the industry like film leader screen-printed throw pillows add a cheeky touch to the clean, sleek furnishings. While the atmosphere is streamlined and cultivated, the Palomar manages to not take itself too seriously. The fully stocked game room, for instance, encourages adults and kids alike to battle it out over skee-ball or darts. If you’re looking for deeper relaxation, you’re invited to nibble on avocado toast and salmon tartare by the pool and indulge in an in-room spa treatment (we recommend the lavender scrub). Considering the sophisticated digs, the Palomar is also surprisingly kid-friendly. Accommodations like hula hoops in the gym, complimentary snacks and kid-sized signature bathrobes ensure that harried parents’ vacations are actually restful. While there are ample dining options within walking distance, it’s worth noting that the hotel’s in-house restaurant, Double Take, is a step above many hotel eats. Chef Bryan Podgorski serves up simple and savory selections like pan-roasted salmon with Tokyo turnips and crispy sweet potatoes complimented by a Greek yogurt sauce and Fresno chili marmalade. Even if you do decide to venture into the foodie-friendly surrounding neighborhood, be sure to make time to mingle while lingering over the Palomar’s evening wine hour. Location: Beverly Hills is in the name, but the Kimpton Hotel Palomar is situated closer to Westwood’s university neighborhood, where you’ll find museums, dining and plenty of college kids on the weekends. If sightseeing and boutique shopping are more your speed, a 5-minute drive lands you in the heart of Beverly Hills. Diddy Riese: This cash-only mainstay cookie shop is both delightfully delicious and supremely cheap. Don’t be intimidated by a line around the block; it moves fast, and the fresh-baked treats are worth the wait. The Hammer Museum: This UCLA-affiliated modern and contemporary art museum sports a constantly changing rotation of deftly curated installations and exhibits, as well as music and film events. For true art buffs, the museum shop boasts one of the best art book collections in the city. Espresso Profeta: Espresso Profeta’s strong brews and ivy-laced courtyard setting make it the perfect pit stop between museum hopping and dinner. The cinnamon- and orange-spiked Caffe Nico is a local favorite. Flame: West L.A. happens to be home to some of the best Persian food in the city. Flame offers mouthwatering renditions of classic breads, dips and stews in an upscale but unfussy setting. Good for: Between the pool, the game room and the student-saturated neighborhood, the Palomar is an ideal choice for young (or young-at- heart) travelers who want a little decadence in their digs. Families would also do well to take advantage of the hotel’s many kid-friendly amenities. Time Out tip: Feeling lonely? Don’t miss an opportunity to participate in the Palomar’s Guppy Love program, which delivers a live goldfish, bowl and all, to your room upon request. The hotel covers all feeding and care, so your only job is to enjoy the company of your new friend.